I really do know, at least on some level, how completely nerdy it is to sit in my car and knit. But, and especially on a rainy day like today, it’s incredibly alluring. I’ve got car seat warmers. My speakers are incredible, whether it’s my favorite playlist or the Haruki Murakami books I’m addicted to listening to while knitting. Starbucks. And, I recently discovered my steering wheel is the perfect place to hang my iPad. Did I mention that there are no kids or husbands in here? There are no cats wanting to run off with the skeins of yarn I’m alternating with. 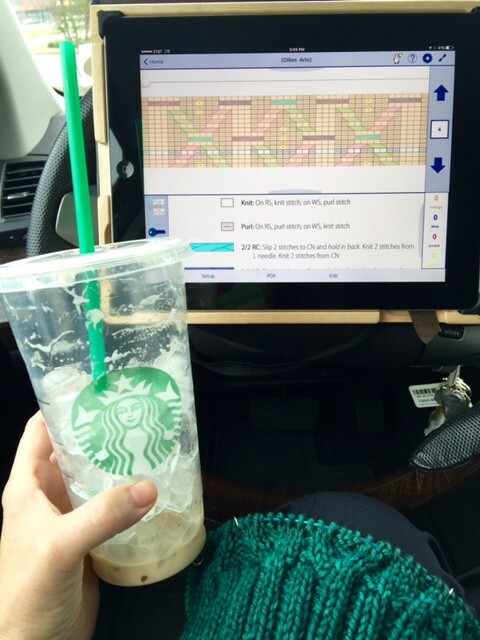 I think I’ll knit a few more rows before I get out of the car. Or maybe, I’ll just stay here for awhile. Ah, you share my guilty pleasure. As much as I love the chance to chat with B en route to ballet, it is the lure car knitting that keeps me from searching too hard for carpool options. no dishes to put away, no laundry to fold. Truth be told, I could do continuing education or paperwork while waiting. But what fun would that be? And now to figure out that steering wheel trick…… Happy Plucktober! The steering wheel trick is great. It works because I have this style although not exactly this one) iPad cover. I flip the cover back over the wheel and it hangs there, perfectly stable. Ill try to get a shot of it, but its intuitive.